Carluccio’s was established in 1991 when Antonio and Priscilla opened their food shop in Neal Street bringing the finest quality regional Italian food to London. They carefully wrote each label by hand and explored the length and breadth of Italy to find the best ingredients from every region. In 1999 they opened the first Carluccio’s Caffe in Market Place which was an authentic Italian restaurant and continuation of their successful food shop. 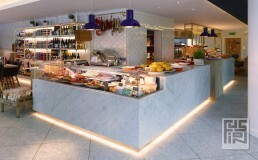 Carluccio’s of the future looks back to these beginnings. 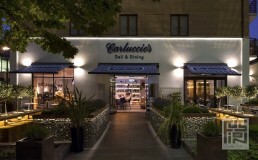 The origin for our redesign of Carluccio’s was to look back at the heritage of the brand. Looking to both Antonio and Priscilla individually, as it was originally the pairing of Priscilla’s design and Antonio’s food from which the brand was born. From delving into the founders we saw that there is a clear contrast between Antonio and Priscilla; Antonio being more relaxed and rustic with his cooking methods which contrasts with Priscilla and the crispness and modernity of her design. They do have parallels with their different styles both being simple, fresh, warm, honest and creative which is where our design comes together. The resulting interior is a juxtaposition of Antonio and Priscilla. The warm soft timbers contrast nicely with the crisp marble, stylish metallic, soft leathers and the honest open kitchen make it a modern day Neal Street restaurant. 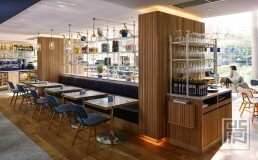 The subtle details included within the scheme immerse the customer in the essence of Carluccio’s. The bespoke artwork tells the Italian food story in a sophisticated and historic style. Food produce from the deli are used as display items through the restaurant reinforcing the message of good quality produce which is the essence of the brand.